Father Christmas certainly has come early to the Write Storybooks office; our students certainly have been getting into the spirit of the season and our inbox has been full to the brim with poems, pictures, and puns galore. We received a whopping 1,135 (!) 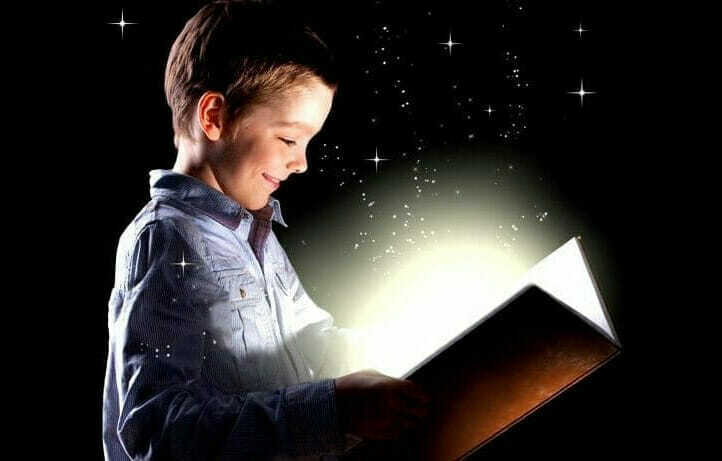 entries for the first eleven days of our 12 Reads of Christmas – A million thanks to everybody who entered and for capturing the festive spirit with your creativity, imagination and encouragement. But before we announce Day 12’s winner, let’s start our Christmassy countdown! 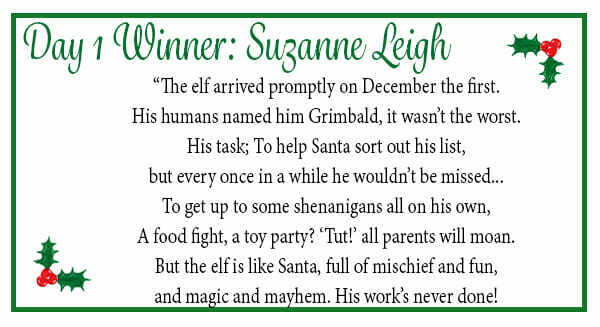 On the first day of Christmas, Suzanne Leigh brought the magic (and naughtiness) of the Elf on the Shelf to life with her catchy rhyme. 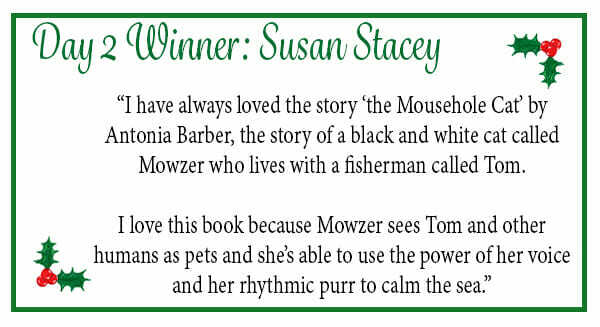 On the second day of Christmas, Susan Stacey had us ready to curl up with her excellent Cornish Christmassy read. On the third day of Christmas, Samantha Gronow heard our Christmas wish and gave us three wonderful Julia Donaldson titles. 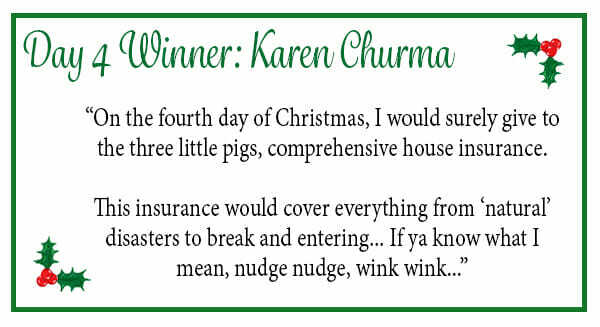 On the fourth day of Christmas, Karen Churma tickled us with her thoughtful (and hilarious) gift to the our favourite fairytale pigs. 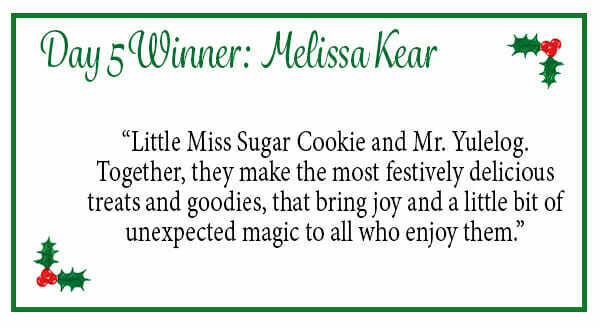 On the fifth day of Christmas, Melissa Kear whetted our appetite with her creative additions to the Mr. Men family. 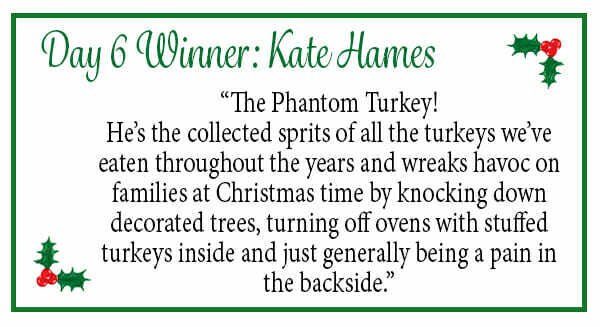 On the sixth day of Christmas, Kate Hames intrigued us with her festive fiend causing mayhem. 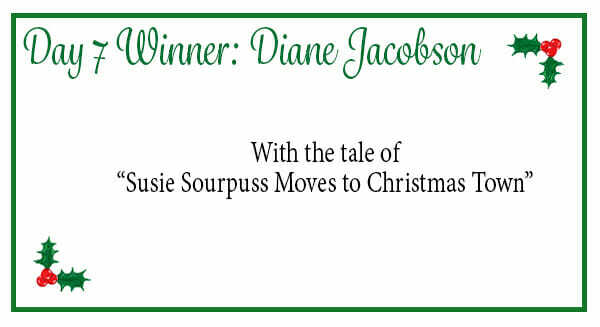 On the seventh day of Christmas, Diane Jacobson wowed us all with the thoughtful and heartwarming tale of Susie Sourpuss, the grumpiest little girl and the Christmas townsfolk who try to help. 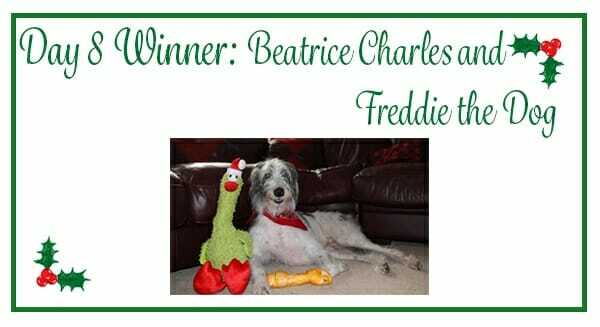 On the eighth day of Christmas, Beatrice Charles and the lovely Freddie captured our animal loving hearts in this animal themed challenge. 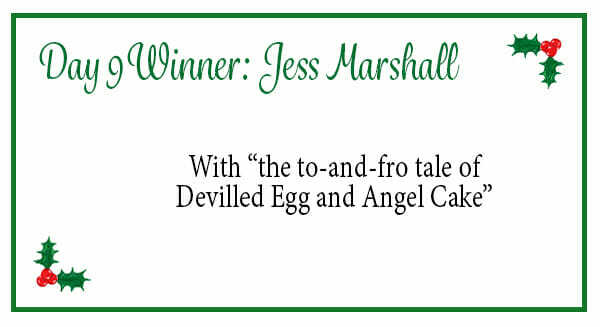 On the ninth day of Christmas, Jess Marshall had us craving a Christmassy feast with her brand new characters for a festive read. 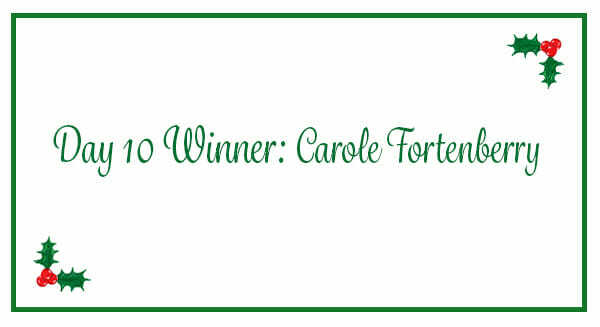 On the tenth day of Christmas, Carole Fortenberry had us feeling especially festive with her Christmas Eve read. 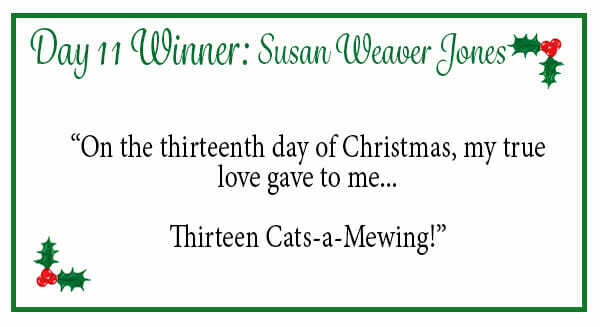 On the eleventh day of Christmas, Susan Weaver Jones gave us an adorable addition to the classic rhyme. Thank you to everyone who joined in, but now it’s time to announce the final winner of our 12 Days of Christmas competition! 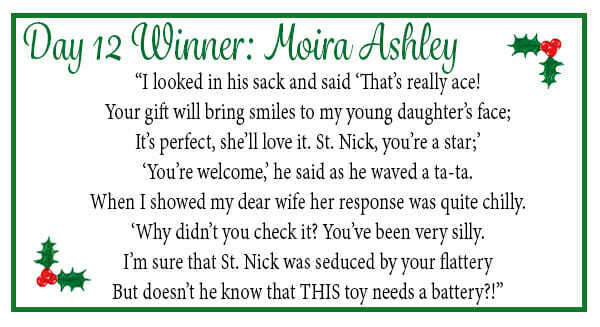 The winner is Moira Ashley! 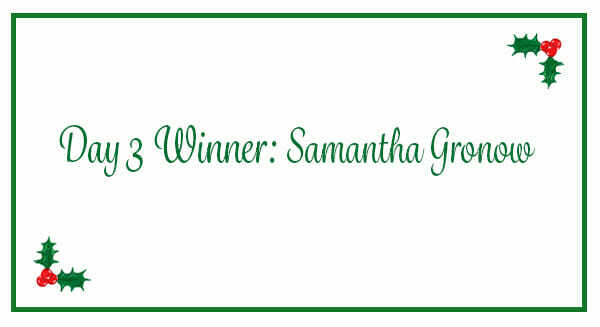 This was by far the most difficult winner to decide, but we absolutely loved the modern ending to the classic poem. We also loved her clever and artful use of rhyme and the way her poem captured the quiet joy of Christmas giving with the tongue in cheek realities which built to the playful ending I’m sure many parents will recognise! 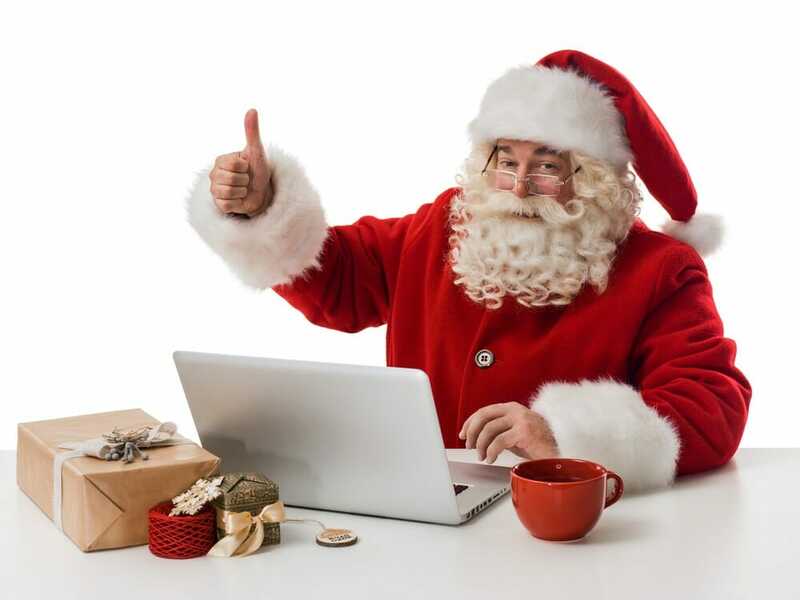 Congratulations Moira, but we should also extend a huge ‘Well Done’ to our shortlist contenders – Tina Tosney, Steve Bond, Ire Heather and Jenni Mack – and each and every person who took part; you should all be incredibly proud and you certainly got us in the festive spirit! Well, all that’s left to do is enjoy the festive season! 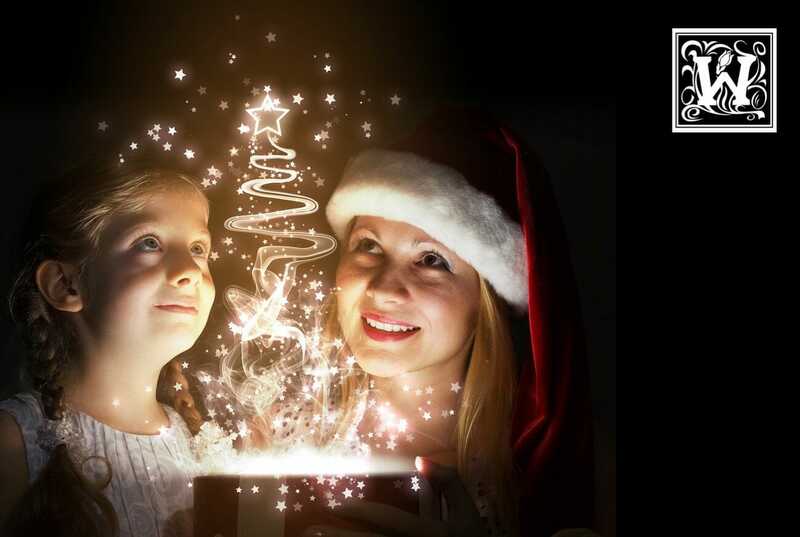 From all of us at Write Storybooks for Children, have a very Merry Christmas and a Happy New Year!